The UK's political leaders need to "do some repenting" and give greater recognition to religion, a Christian Peoples Alliance candidate has said. "Our whole political system has hardened itself against God in rampant secularism," said John Manwell. "This has to change," the candidate for Liverpool Walton said. 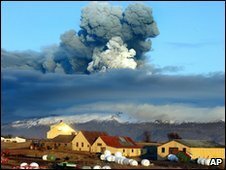 Ash "is a clear Biblical sign of repentance" and the Iceland volcano was a reminder that "the human race is powerless compared to God", he added. "As a sign from God, it was gracious; no-one was killed." Mr Manwell called for "a fresh approach to politics" in the UK, urging people to their faith in God, rather than political parties. "Surely it is time to call on God and seek His help in healing the brokenness of Britain." The Christian Peoples Alliance is fielding 17 parliamentary candidates in the general election, and has 130 candidates standing for council seats across England. It also has three councillors in the east London borough of Newham, including its leader, Alan Craig. Mr Manwell is standing in Liverpool Walton in the parliamentary election on 6 May. The other candidates are Daren Ireland (Trade Unionist and Socialist Coalition); Adam Marsden (Conservative); Patrick Moloney (Liberal Democrat); Joe Nugent (UK Independence Party); Steve Rotheram (labour); and Peter Stafford (British National Party).